This is just amazing. I had never used it until a couple of months ago. My Senior Stylist Georgie swears by it and told me I must use it on my hair. So I bought a bottle. My hair had been bleached 3 times in a short period of time and Moroccan Oil has really helped keep the condition. So of course if I now can’t live without something I am going to provide this little miracle on our shelves and change the lives of my clients too. I am sure lots of people will think “oh I’ve used Moroccan Oil before”, some of you may actually have. But it’s important to note that Moroccan Oil is a brand name. It’s one of the original oils that came onto the market. There are lots of products on the shelves in the supermarkets that say they are Moroccan or have some form of Argan oil in but they aren’t the actual original Moroccan Oil. 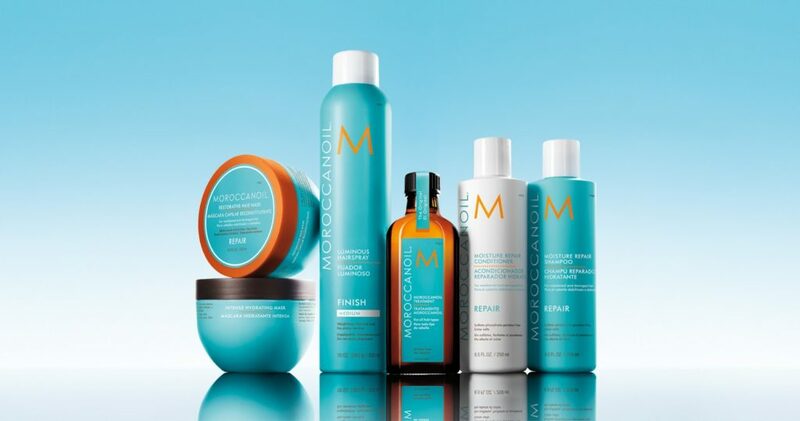 I saw a shampoo in a pound shop the other day that said Moroccan on it with the turquoise coloured bottle. Definitely not the same. I know people can be wary of oils making their hair greasy but Moroccan Oil doesn’t leave a residue. It isn’t runny like other oils that just sit on the top of the hair, it absorbs into the hair straight away nourishing it from the inside out. It contains antioxidant rich Argan Oil and shine enhancing vitamins which leave the hair smooth and hydrated from root to tip. Also for these hopefully sunny summer months we have ahead it contains UV protectors in the Argan Oil protecting your hair from the sun. My hair is really long and I’m growing it and I’ve been bleaching it and this genius little oil is helping me brush through my hair without breakage allowing me to maintain my length without compromising the ends. Plus for fine and really blonde hair there is a light version specially formulated for your hair type so as to not weigh the hair down. We have the 25ml bottles in salon for £14.25 and we currently have a great offer on a 125ml bottle and a free intense hydrate mask for the same price as a 100ml bottle at £32.85 which is a giant £23 saving. Coming into stock as of Wednesday we have the new Moroccan Oil Mending Infusion. Infused with Hydrolysed Quinoa, Argan Oil and Baobab Extract, the antioxidant-rich formula enhances softness and shine, whilst defending against split ends, brittleness and breakage. Tames frizz and promotes a smooth, sleek finish without greasy residue. I will be trying this out on my hair so keep a look out for that blog post. These products excite me… mainly because yellow is my favourite colour this season and the bottle is bright yellow but it also has the most amazing peachy fragrance. 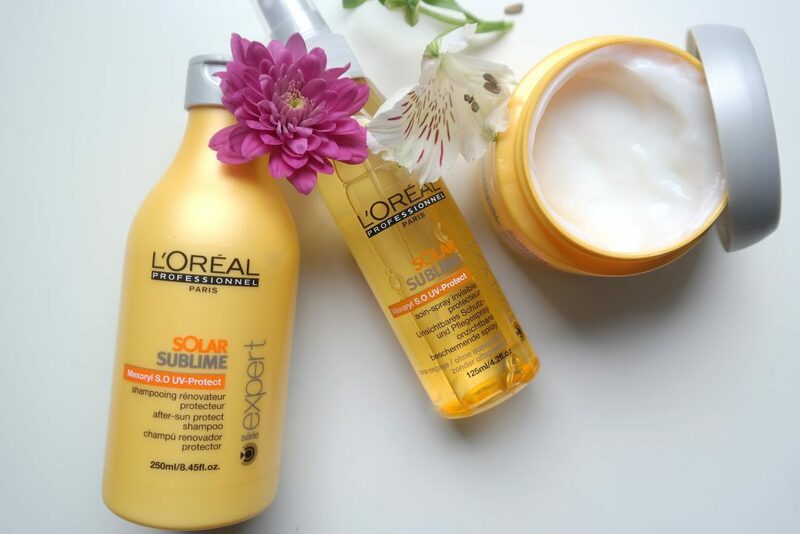 There are 3 products in this range that L’Oreal only have available for sale through the summer months. There is a shampoo, mask and leave in spray. It’s basically sun cream for your hair. The shampoo gently cleanses your hair while removing salt and chlorine, so basically you can wash the beach right out of your hair. As you probably all know chlorine and salt are very drying on the hair and aren’t always removed effectively with a standard shampoo. They also contain Mexoryl S.O UV-Protect, a UV filter that helps to protect your hair fibre after exposure to the sun. The leave in spray you just spray into the hair before exposure to the sun, bish, bash bosh. We protect our skin so we must protect our hair too, not all of us are fortunate enough to suit a hat hahaha! Solar Sublime is available now in salon starting from £12.50. You have to pop in even just to smell it, I can’t explain how amazing it is.